In the trade office the merchants' carts get improved and equipped with powerful horses. The higher its level the more your merchants are able to carry. 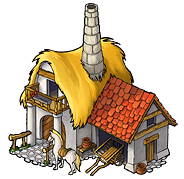 With each level of this building, merchants will be able to carry 20% more resources. The Roman Trade Office provides a bonus of 40% per level, rather than 20%. This bonus only applies to the Roman trade office. Note: on servers started in 2018, except Path to Pandora, the bonus is half of that (20% per level for Romans, 10% per level for other tribes).